In line with our earlier articulated strategic plan, the focus of the business in 2013 was to scale up by growing our client base across all lines of business with particular attention to Personal Banking and SME. We were able to surpass the one million customer mark within the year after acquiring >360,000 new customers in the period. We will continue to grow our active customer base to achieve desirable scale. because of its responsiveness, transparency and integrity”. These are the words of a senior Human resource personnel as also echoed by other employees. We continued to pay particular attention to our relationship management capability and service delivery, ensuring that every target customer is served by a relationship manager and that customer experience within our branches and other touch points continue to be consistent and reliable. It has been an impressive year in our retail banking business, having successfully assisted individuals and small businesses to smoothen their cash flows with the provision of consumer and small business loans to support their needs, our unsecured lending position has reflected overall good credit behaviour of benefitting customers. Our focus on providing consumer finance was recognized in the course of the year when our Bank won best Vehicle and Asset Finance Bank at the On Wheels Motor Industry awards for the third time in a row and the Most Innovative Bank by Business Day newspaper for our focus on those market segments. We continue to gather momentum in the business focusing on the growth and efficiency of our balance sheet. Given our existing investments and cost base, our focus is on achieving a stronger top line while managing our expenses appropriately. We plan to continue to grow our business with acquiring more customers across our chosen client as the importance of scale cannot be over emphasized in the growth phase that we are in. In addition, we will maintain our focus on Customer Relationship Management and improving operational efficiency through effective channel management. The Corporate and Investment Banking (CIB) business continues to make great strides in Nigeria’s challenging and complex economic, capital markets and regulatory environment in pursuit of its goal of being the clear leader in corporate and investment banking in, and for, Nigeria. In 2013, Stanbic IBTC Capital Limited advised Danone, one of the largest food product manufacturers in the world, producing fresh dairy, water and nutritional products globally, on the acquisition of Fan Milk in partnership with Abraaj, a leading emerging market focused private equity group. The diversified skills and expertise of the various units in CIB – Client Coverage, Global Markets, Transactional Products and Services and Investment Banking – and our linkages to the international capabilities of Standard Bank Group, enables us to deliver to our clients a broad array of services at market- leading levels of quality. In 2013, greater collaboration across units in CIB and with the Wealth and PBB businesses within Stanbic IBTC Group has helped to make the CIB client proposition more robust. Our CIB client revenue achieved record levels, up nearly 100% from the year before. Increasingly, we are utilizing our breadth of capabilities more effectively to capitalize on the opportunities we see in the market. An example of the collaboration across functions is our retail foreign exchange business, which drew on capabilities in Global Markets, the branch network, Business Banking and the public sector, to achieve year-on-year growth of 211%. The significant growth in our total client revenue reflects in part our linkages to Standard Bank’s franchise. Standard Bank Group’s sustainable competitive advantages are based on our presence, knowledge and experience across Africa, our capabilities in key strategic international capital markets, and the heritage and extent of our expertise in natural resources. Generating value for our clients underpins our strategy and differentiates our franchise. We will continue to develop our client management capabilities and deliver a consistent CIB client offering and experience which will enable us to maximise cross-selling opportunities and deliver optimal financial resource utilisation. Cost efficiency and improving our operational performance are the cornerstones of improvements in our cost structure, margins and capital ratios. We will continue to help our clients grow through increased lending to the resource, manufacturing, agriculture and service sectors, and by raising debt and equity for our clients in the local and international capital markets. The Wealth division focuses primarily on pension administration and management, private non-pension asset management as well as trusteeship and estate planning business. crossing the N1 trillion mark in assets under management. The wealth business model is primarily focused on assisting our clients in investing in a variety of eligible asset classes including fixed income and equities markets to effectively deploy, accumulate and preserve wealth. However, in doing this, we are committed to ensuring security, liquidity and reasonable returns over a medium-long term investment horizon. Across the Wealth division in 2013, we maintained our leadership position in the industry by further increasing our client base and assets under management as well as introducing new product offerings. For the pension business, we added over 160,000 clients closing the year with 1.22 million RSA clients. 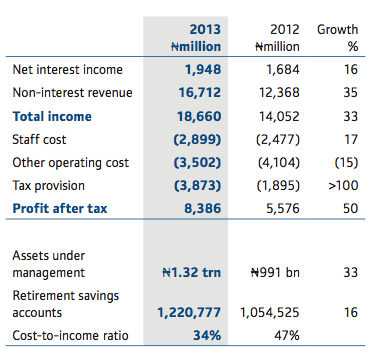 Assets under management grew by 34% to close at N1.16 trillion (USD7.19 billion). The first ever mobile pension office “Pension on Wheels” was launched during the year. This initiative is in line with our commitment to ensuring that all our clients experience excellent and convenient service at all times. 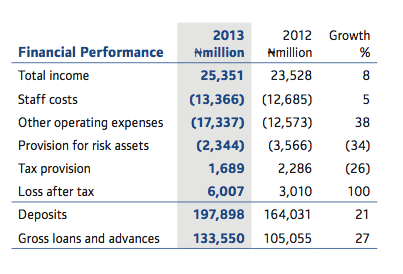 In 2013, the Wealth Group continued to benefit from the positive performance of the Nigerian capital market. The impressive equities market performance could be attributed to factors such as the rub-off effect of the largely impressive 2012 year end results; impressive valuation of blue chip consumer names; growing investors’ confidence; and significant increase in foreign inflow into the market. Yields on fixed income instruments were lower than last year on average due to a significant drop in headline inflation levels and relative price stability; they were however still strong enough to support positive return on our portfolios. 2014 has the potential to be another positive year for global equities, though not on the level witnessed in 2013. After a year in which multiple expansion has been the dominant factor, we expect that financial markets will gradually pay more attention to the underlying profitability of the companies, given the gradual phasing out of the US Fed’s generous monetary policy. On the fixed income side, 2014 is a pre-election year in Nigeria and is usually characterized by higher spending; Federal government spending increased by nearly 50% YoY before the last election in 2011, enhanced by supplementary budgets.